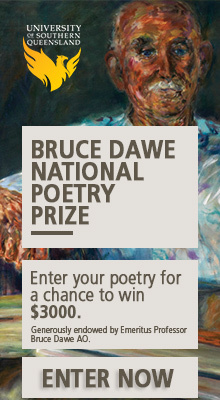 This prize was established in 2007, with support from the Malcolm Robertson Foundation, to foster poetry by writers who have not yet published a book of poems under their own name (see the prize guidelines for details). The 2014 major prize is $6000, with a second prize of $2000 and a third prize of $1000. All three winning poems will also be published in Overland . The 2014 competition closes at midnight on Saturday 15 November. The competition will be judged by Overland poetry editor, Peter Minter, with winners announced in the first issue of Overland in 2015. Writers can subscribe to Overland for one year (four issues) at a discounted rate, and enter the competition at the special subscriber rate. Take out a new subscription, enter the poetry competition and go into the draw for the major subscriberthon prizes. Entry to the competition for non-subscribers is $20. Non-subscribers enter the competition here.